Please send an email to the address given for Ringing/Tower Contact on the Contact Us page if you wish to be informed when updates are made to the news page. 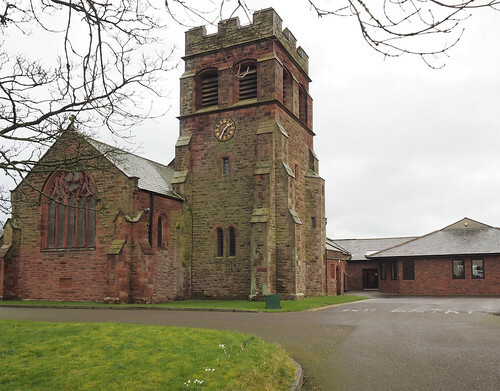 Heritage Lottery Fund - Microgrant - "Barrow Bellringing Public Engagement and Access"
The Heritage Lottery Fund (HLF) has just awarded £3,000 for work associated with the belltower at St James the Great in Barrow-in-Furness. Made possible by money raised by National Lottery players, the grant covers six elements which focus on access, training facilities, and the heritage of the bells. A handrail to the ringing room will be extended to the top of the tower to help visitors reach the viewing gallery in the old belfry where the visitors can see the dramatic spectacle of the bells ringing just a couple of metres below them. An 8 bell simulator will provide a training facility that can be used to provide extra training sessions to help people of all ages learn the skills involved without disturbing neighbouring residents. This will be supported by a leaflet introducing bellringing and encourage recruitment by explaining what an interesting and enjoyable activity it is. The grant will also be used to emphasise the heritage, both historic and social, by creation of a 70 page photobook describing the bell restoration project (including a copy to be presented to the local records office), a leaflet to describe the heritage of the bells, and a plaque to commemorate a long serving tower captain. There will be open days this year in spring and autumn for the public to see the bells, photobook, leaflets, and find out more about the heritage of our bells and what bellringing has to offer everyone in today’s world. There will also be an open and free invitation to learn to ring, especially this year for the government backed campaign to recruit 1400 new ringers nationwide in time to learn to ring for the centenary of Armistice day in November. The ‘Ringing Remembers’ website introduces this project, and it is also possible to register online, or contact Andy Pollock (Contact Details) - email/text messages anytime, calls best during evenings or weekend. 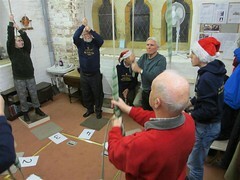 Bellringing does not need much strength but offers a moderate ‘workout’ for both body and mind, and is a great activity that develops concentration, precision and teamwork. It is suitable for anyone from secondary school age upwards and develops skills and friendships that will be useful and welcomed wherever you live. Preserving a unique skill, it is free to learn, and can help to celebrate local/national events and weddings. To find out more please visit www.barrowbells.org.uk for information and contact details. The first open day will be announced as soon as the new handrail is completed and installed, but anyone who would like to ‘give it a go’ earlier can get in touch and we will put you in touch with a tower in Furness and South Lakes. Christmas morning service we manage to get all 8 bell ringing for service. Wishing everyone a HAPPY CHRISTMAS and good health and comfort in 2018. Pleased to announce and congratulate Cameron for his successful quarter peal on an inside bell on just the second attempt. That is his second successful quarter peal (the first being on the treble), and his rapid progress shows promise to overtake his dad and become a much more accomplished and competent ringer. Conductor is proud father and Godfather. 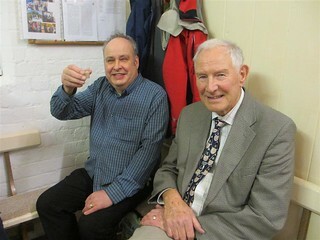 It was great to welcome Dennis Ellisdon back to St James for the quarter, and Phoebe as solid as a rock on the treble. 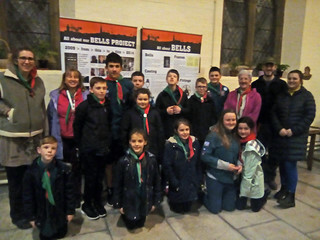 The 11th Barrow Scouts from Beaconhill came to visit the tower, and were shown handbells by Keith Newby who introduced the scouts to change ringing downstairs in the church, and were also given a tour of the tower climbing over 11 spiral steps to the old belfry to watch the bells being rung beneath their feet, and then have a go at ringing the bells themselves in the ringing room. 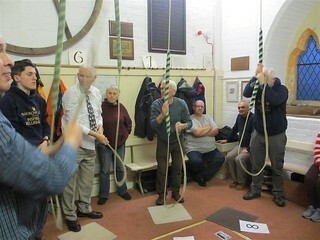 Even some of the leader had a go, including Louise Nixon (a member of the tower) who demonstrated she could still ring after her elbow injury. On Saturday 11th November 15 ringers attended the monthly ringing meeting held at St James the Great, in Barrow in Furness. They were from Barrow (7), Dalton (1), Kendal (1), Millom (2) and Ulverston (4). 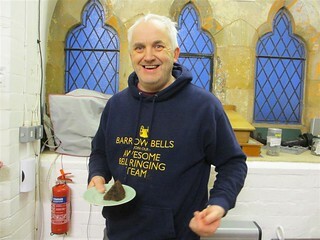 Our normal Ringing Master apologised as unable to attend due to a family illness, so the Barrow Tower Captain stood in. 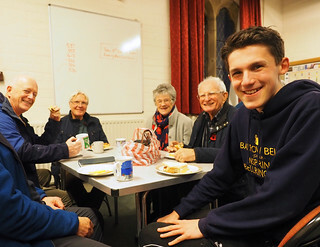 An influx of more experienced ringers enabled us to ring Plain Bob Minor (plain course and a touch), Little Bob Minor (twice), Steadman Doubles, Grandsire Triples and Little Bob Major (almost!). In addition, there was much plain hunt and call changes on 8 and several ‘firsts’ were scored. A well-known ringing musician was serenading us from downstairs on her cornet and strains of ‘Silent Night’ were heard in the ringing chamber when some of the striking was not going too well. 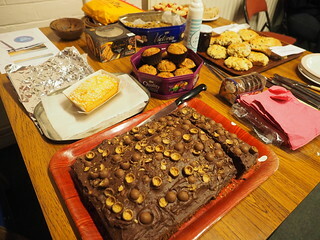 A sumptuous spread had been prepared by Ros (Holme), Sue, Jo, Ken, Ian, Alan, Andrew (Smith), and Andy which included gluten free and much home baking. Several trips to the groaning food table were observed from everyone and we were fortunate to be aided in our task by two guests; the vice chair of Barrow Borough's Executive Committee who is also the Chairman of NULEAF (Nuclear Industry Advisory Forum), and Louise Sutherland from the Lottery Heritage Fund who was visiting St James’s but unfortunately without her cheque book. 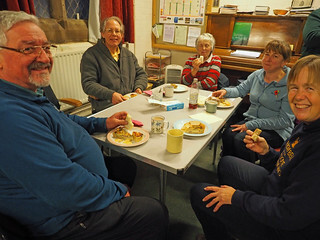 These two visitors contributed to much non-ringing discussion which meant that many kept enjoying the spread and did not leave until 17:40! Louise Sutherland (second from left) of the Heritage Lottery Fund is welcomed to the tower and is given a demo, and tour. 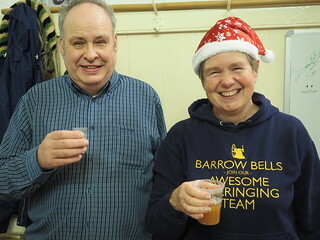 The Branch gives thanks to Andy Pollock for Mastering the afternoon, the Vicar, Fr Jack Knill-Jones, and to the churchwardens John Simpson and Brenda Pearce (who came and put on heating in Carey Room) for the use of their bells. The next monthly Branch meeting will be on Saturday December 9th at St Michael’s Church Hawkshead. We rang the Church bells before and after the funeral service for Eric Clarke Pearce who passed away peacefully at Furness General Hospital, on 23rd September, 2017. He was a gentleman, and someone who quietly got on and made things happen without any fuss and without expecting any recognition. He was an easy person to get on with, friendly and interested in you but a quiet and relatively private person himself. 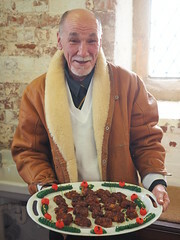 We were very fond of Eric and will miss him dearly, and our thoughts and prayers are with his family, and especially Brenda his beloved wife and Churchwarden at St James. 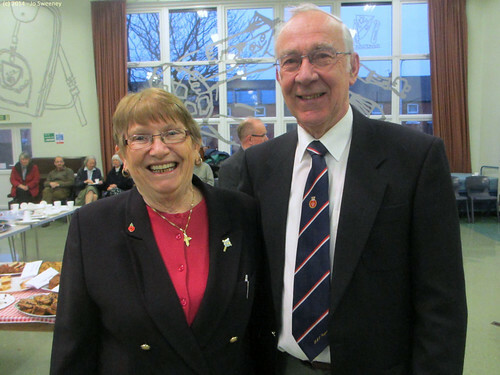 Brenda and Eric Pearce on Sunday 9th March after the re-dedication of the church bells. 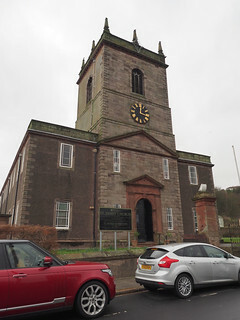 Jo Sweeney and Andy Pollock drove to workington for a safeguarding course by the Carlisle diocese tailored for bellringing - particularly for those involved in teaching bellringing (but anyone who has connection/responsibility for ringing and vulnerable persons at a belltower in the diocese. We rang the bells to remember the life of June Parkinson who passed away on 17th August at the age of 73. She had a bright and cheerful nature with a disarming smile and infectious sense of humour that brightened up the day for everyone around her. 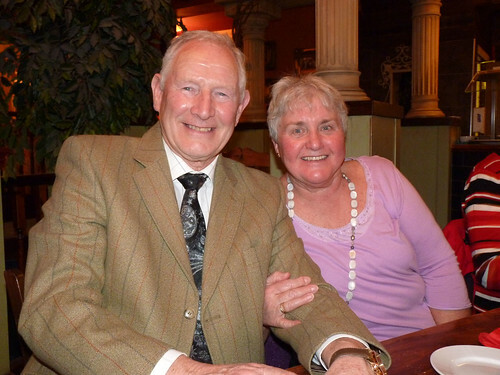 Our thoughts are with all her family and especially her devoted husband Ken who is a bellringer at St James. She always loved to hear the bells and we hope they brought some comfort today. We will all miss her but we are grateful that we had the privilege of knowing her and giving us happy memories. God bless June. 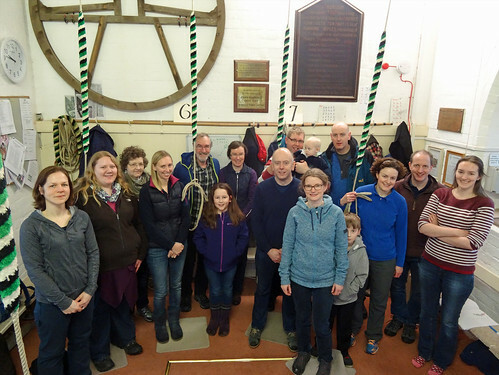 A peal was rung to celebrate and mark the 140th anniversary of the bells, with ringers from Barrow, Broughton, Hawkshead, Whittington, Heptonstall, and Cambridge. Barrow entered two teams into the striking competition, the A team consisting of 3 members of the tower and 3 regular visitors to the Barrow practice, ringing two plain courses of Plain Bob Minor, and the B team (dubbed the re-B-el team as not all ringers were members of the LACR through choice or not being elected yet, and so would not be eligible to be ranked) was an all Barrow tower team, and was announced as a 'scratch' team. The A-team had an early mistake which led to further faults, and so it was called round and re-attempted. Unfortunately the false start was the undoing of our team this year, but this was partly due to a lack of practice as a team beforehand. The attempt after the false start was much better and a good standard, with notable performances by Sue managing very well on the treble and Cameron similarly accomplished on the 3rd. Roll-on 2018 when we can show what we are capable of, with even more progress over the next 12 months. The B-Team had Jo on treble, Sue on 2nd, Jason and Cameron on the 3rd and 4th respectively, Andy Pollock on the 5th, and Ken on tenor. 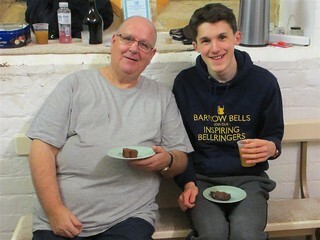 Ringing rounds and call changes, congratulations to all the team for ringing exceptionally well, and special recognition to Jason who had not even led before the evening and managed one brief practice before the main piece where he coped admirably. It is very clear that we have made real progress together over the last 2 years since the restoration of the bells. Well done all! All 8 bells at St James were rung for the marriage of Adam Ritch and Anya Graham. "BBC Music Day is returning for its third year on Thursday 15 June 2017, celebrating music’s ability to unite communities across generations, and this year bell-ringers have been asked to play an even bigger role." We set up for a cross-generational band for a quarter peal with range of ages covering over 55 years between youngest and oldest. There were ringers in teenage years, 20's, 50's, 60's and 70's. The ringing was extremely good, and our youngest ringer was attempting first quarter peal on a working 'inside' method bell for plain bob minor. 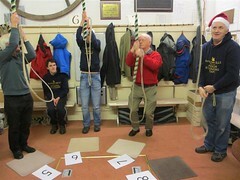 Unfortunately, as we were about to begin the final course, having rung for almost 45 minutes with barely a hesitation or mistake, there was a mix up and within a further lead where the next to last call was to be called, we had lost the quarter with just a few minutes ringing remaining. 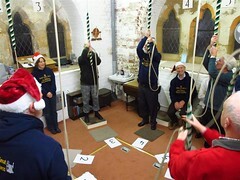 This was a great shame as the everyone's ringing deserved to get the quarter peal, but there will always be another opportunity to try... we will have to arrange the next attempt soon. 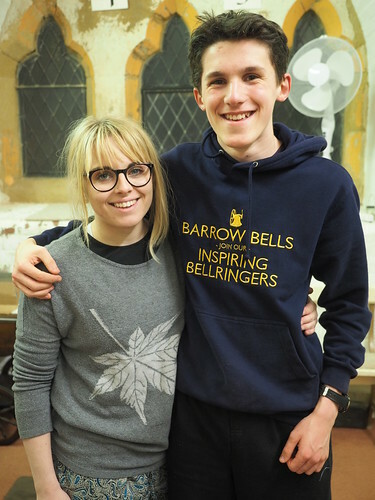 At least the people of Hindpool and within earshot of the church were treated to some fine ringing, including Adam Ritch and Anya Graham who were having their rehearsal for their wedding at the weekend. The branch monthly meeting was scheduled for Holy Trinity church in Chapel Stile in Langdale so we arranged to meet up at Hawkshead for an early ring and see whether the weather would allow us to go for a walk in-between. Below is a brief account and a reduced selection of thumbnail phots from the day... more can be seen in the Google photo album, and also in Jo Sweeney's photo blog. List of special 'musical' call change. the 'big bang' of call changes. We give it a go, with varying success, but good fun. Linda (Ulverston), Jo, Andy, Sue, Clarissa, and Ken... John Gunner (Hawkshead) behind the lens. Too wet to walk... plan B springs into action - Jo Sweeney's cake radar works a treat! Three of Ruskin's own handbells! Jo and Sue - Barrow pixies keeping out of mischief. All 8 bells at St James were rung for the marriage of Melanie Graham and Darren Reid. The branch monthly meeting was scheduled for Kirkby Stephen so we siezed the opportunity to visit Orton and go for a gentle potter along the River Eden beforehand. 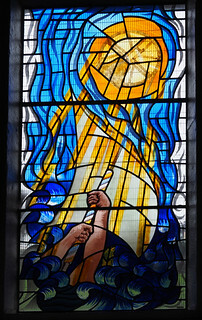 Below is a brief account and a reduced selection of thumbnail phots from the day... more can be seen on Flickr photostream, and also in Jo Sweeney's photo blog. 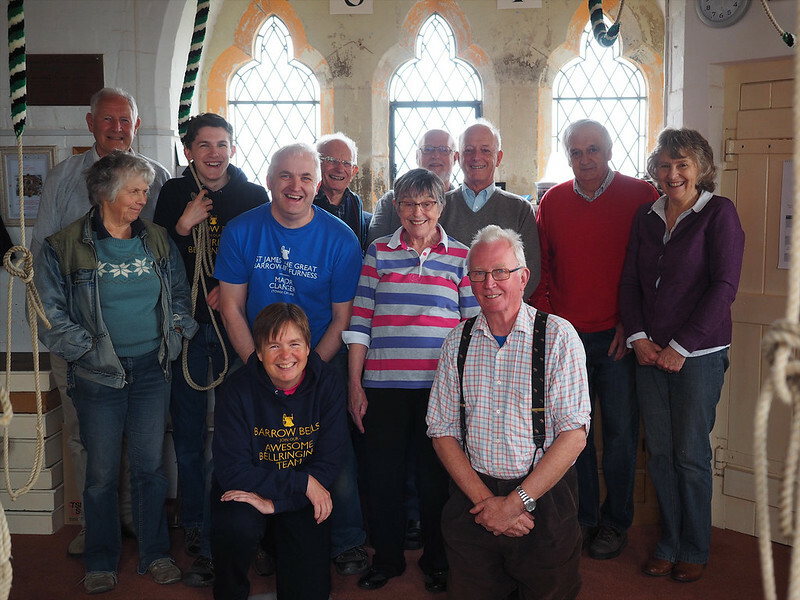 for open ringing at All Saints church in Orton. Lovely musical ring of 8, and easy to ring. and has eaten half before I get my camera out! chocolate orange cake with cream! ... yum! has another glass fronted mezzanine ringing room. despite her T shirt she did not go wrong or improvise! 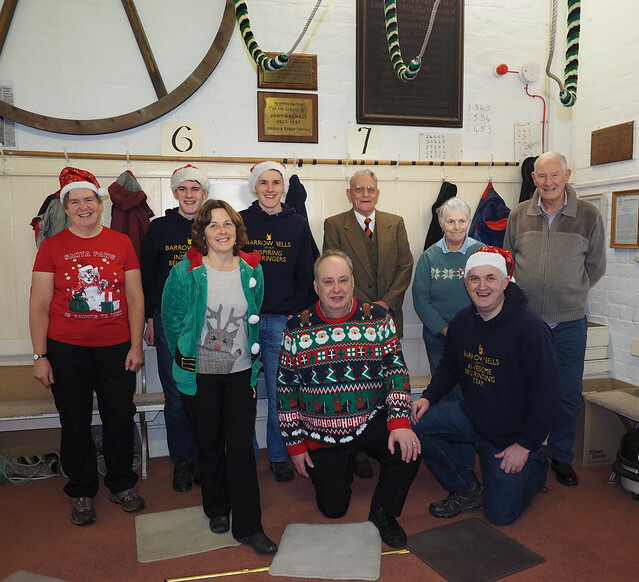 Our merry band of ringers lined up in height order...almost! Andy Pollock, Sue Fryer, Cameron & Jason Pollock, Jo Sweeney. A sandwich course! 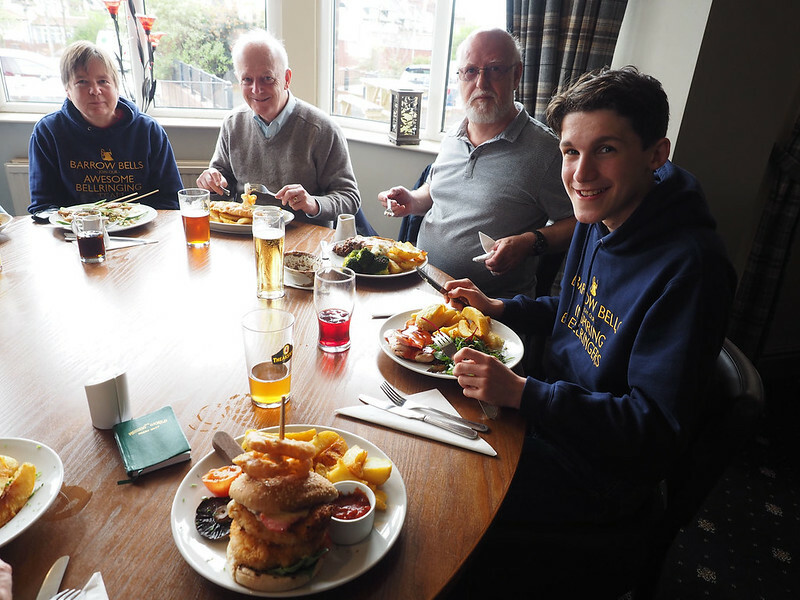 Two sessions of ringing training for our learners (including visitors) sandwiched a very enjoyable and relaxed meal at the King Alfred on Walney Island. 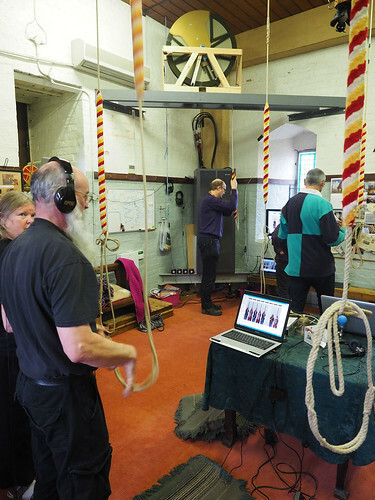 The first session was rung on the 6 bell branch simulator, the first time it had been used for a full silent practice (normally just used for individual bell-handling tuition before practice night). The simulator worked exceptionally well and allowed us to have more ringing in the day with less disturbance for the local residents surrounding the church. The bell handling and sound for the learners is a satisfactory compromise, but it would be important to finish off the day without the simulator (the bells rung open) to ring the bells for real. Front Row (standing mostly): Clarissa Caroe, Andy Pollock, Beryl Jefferson; Front Row (kneeling): Jo Sweeney, Andrew Smith. Each learner had at least one target to work on learning, and each learner took turns to try their learning objective with the support of the helpers, including our own experienced ringers Clarissa and Andy, and fantastic support from Ian Taylor and Alan Dewar (ringers at Ulverston), and Keith and Anne Hackney (ring all over the branch!). Good progress was made but the afternoon session promised to consolidate and make further prohgress. We were joined by Owen Osmotherley and Jacqueline Preston for the afternoon session, and with their help we completed a very successful day. Thanks to everyone! for sacrificing time to help and support the learning on the day, and the learners from Barrow and Ulverston for working hard and striving to make progress. Good progress was made, and a lot of fun was had along the way. A thoroughly enjoyable day, and one that will strengthen the ringing in the area. The back 6 bells at St James were rung for a quarter peal (well over 1000 changes) to celebrate St George's day and 'Ringing for England'. The quarter peal took about 49 minutes to ring and was Camerons first ever quarter peal, and he rang the treble impeccably. Congratulations Cameron - an achievement very well done! 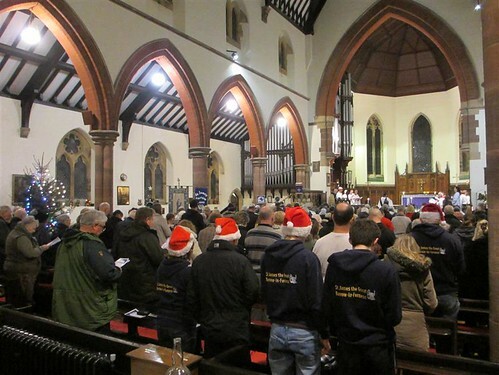 All 8 bells were rung for the special 'Believe in Barrow' service welcoming, participating and sharing with people from all across Barrow including Anglican, Methodist, Salvation Army etc. The service ended with over 200 pancakes and lots ofg different toppings. Four intrepid adventurers from Barrow set off early for a day of ringing in Carlisle Diocesan Guild as part of their training day, driving over a frosty and slippy Corney Fell to meet at Hensingham at 9.30am to register, and elect new members (5 ringers from Barrow were duly elected to join two existing members from our tower), and then work out transport and set off to respective towers. 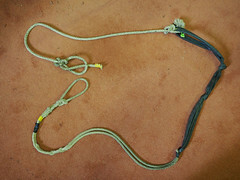 Iwan was a learner in the learning ropesight group in which Andy was a helper. Clarissa helped in one of the two groups dedicated to new ringers gaining experience of changing place - concentrating on speed, bell control and striking. Cameron was in the more advanced group looking at first methods and touches of these methods. Morning and afternoon sessions gave plenty of opportunity to try out and consolidate what what was learnt. There was just enough helpers for the helpers to grab a break occasionally, but Clarissa and Andy rang almost every ring (and were tired but satisfied they had contributed to the success of the day). Cameron practiced touches of plain bob doubles (which his first attempt was only at practice the wednesday before the training course) at Cleator Moor, and Arlecdon. At Whitehaven and Hensingham, Iwan trebled to various methods (including touches to mix up the order he passed the bells) including Plain Bob, Grandsire, St Simons and St Clements. 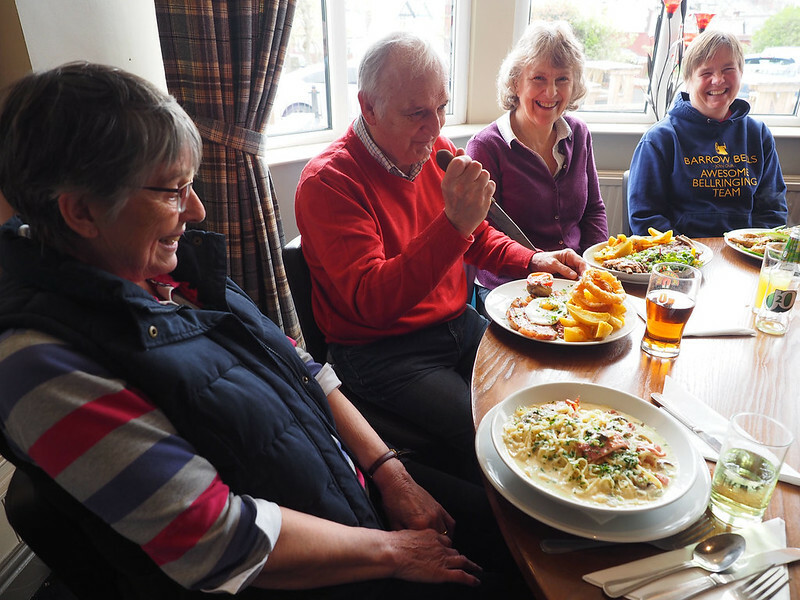 Lunch was pre-booked at nearly pubs, and was an opportunity to have a rest and enjoy good food and company. 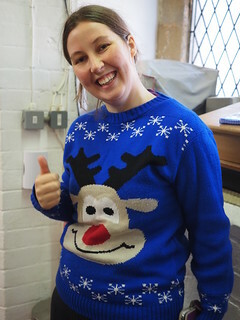 All the ringers - tutors, helpers and students seemed to have a good time, and everyone finished the day with the rewarding feeling that real progress had been made! Saturday 28 Visiting Ringers - Whickham Ringers Reunion Trip. 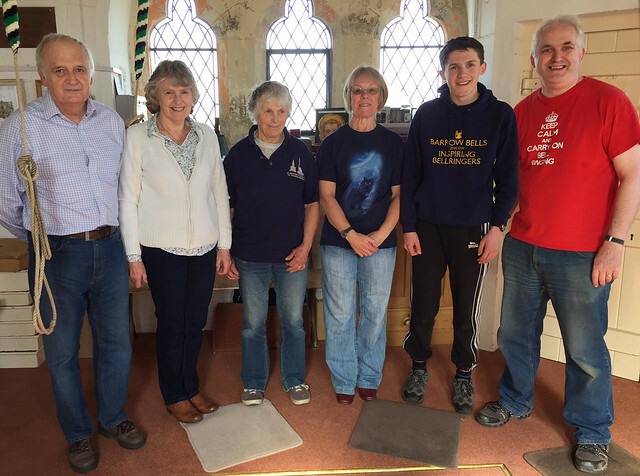 Barrow welcomed a group of bell-ringers on a ringing tour of Furness and South Lakeland (Barrow, Broughton, Dalton, Ulverston and Flookburgh). Unfortunately the weather was dismal with fine misty rain and a chilly breeze, but the bells would hopefully make up for the conditions outside. 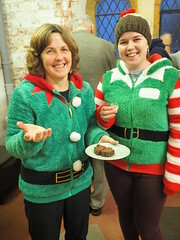 About 8 ringers arrived early and were ushered inside out of the rain, followed about five minutes later by a further group armed with hot drinks and cakes for breakfast! A good plan I thought. They patiently waited for the chimes to strike 9am and then rang the bells up nicely in peal. 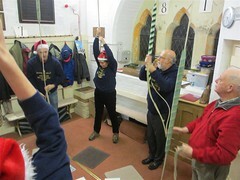 Ringing included rounds, Stedman, and Pudsey plus others, and they were clearly enjoying themselves. Some took advantage of the opportunity to climb further up the tower to the old belfry to see and hear the bells ringing below their feet! After 45 minutes ringing the group prepared to set off to Broughton by catching the next train to Foxfield. 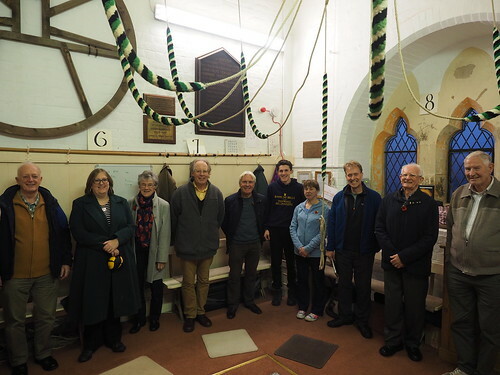 As they departed, some of the ringers recalled the difficult and average sounding bells from before the restoration, and commented on how good the bells sounded now, and what a good job had been done with the tuning of the bells. 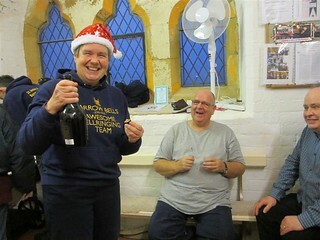 We were espescially pleased to know they enjoyed the bells. A single bell was rung half-muffled from 7pm for approx. 18 minutes on the 72nd anniversary of the liberation of Auschwitz death camp. Setting the tenor bell very briefly on each stroke meant the toll was slow and a poingnant reminder to all those in earshot of the church that we must not forget this and other genocides. Holocaust Memorial Day aims to ensure we do not forget all the victims and people affected by genocides such as the Holocaust and Nazi Persecution, Cambodia, Rwanda, Bosnia, and Darfur and to ensure we continue to learn the lessons from the past to create a safer, and better future. The church was also open until 7.30pm for anyone from the local or wider community to come and say a private prayer or sit in quiet contemplation. Andy Pollock attended a stakeholder meeting chaired by Heritage Lottery Fund development officer Maya Sharma with the new head of region Nathan Lee, kindly hosted by Signal Films at their offices in Cookes Studios on Abbey Road. It was a very interesting meeting with lots of very enthusiastic representatives of different historic and natural heritage sites and resources. There were lots of constructive discussions about what there was to offer and how we could try and spread the word to local residents and visitors. Later in the day Maya Sharma was able to visit the tower to see the magnificent results of the HLF funded project to restore the bells. She managed to reach the ringing room with the aid of the handrail but declined a visit to see the bells close up from old or new belfry. She learned about the bells, the restoration, how we ring the bells, and even had a go herself. Heritage and traditional skills in a modern context! 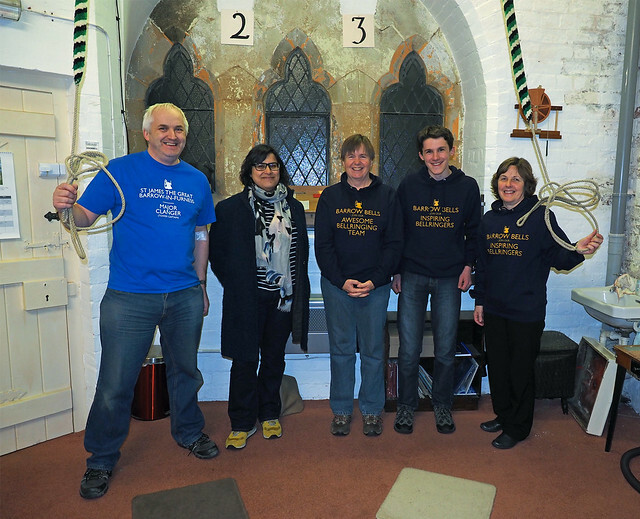 Maya Sharma (HLF development officer) meets the bellringers, learns about the restoration project and tries her hand at ringing! There was no early ring organised, but when the weather looked promising, a walk was arranged to coincide with the branch ringing meeting at Cartmel. Eight people - ringers and family went for a gentle and short walk up Hampsfell, a hill behind Grange-over-Sands with great views over Cartmel and to the Lakeland fells. Heading back down, with view over bay and Heysham power station. Iwan pleased to be taller than everyone else / Ringer access through medieval walls of priory.